MANY thanks to ALL who have downloaded a copy of In the Best Interest of the Child! Making sure Rena was still sleeping, she exited her vehicle, following the sidewalk to the driveway where a flatbed tow truck came fully into view. A large, burly, dark haired man was winching a late model Mercedes up onto the flatbed. Nearby, a far shorter man stood with his arms folded across his broad chest, obviously not happy. As she got closer, Olivia believed the shorter man to be near her age, even though a head full of curly black hair gave him a more youthful appearance. Olivia smiled as she passed the tow truck driver, noticing how his eyes lingered on her hips. The shorter man didn’t notice Olivia until she was right in front of him, and he started as though coming out of a trance. He regarded her with a wary look. She stuck out her right hand. He spoke the last part of the sentence in a raised voice, making sure the tow truck driver heard him. The driver pulled a face in his direction. Olivia and Bruce both laughed aloud at Courtney’s snarky comment. Courtney pumped his fist in the air. “Well, there’s that too,” Courtney quipped. Reaching for the side door entrance, Courtney Bellamy addressed Olivia. Courtney threw one last taunt at his cousin. “You wouldn’t dare!” he countered. He caught Olivia’s eye as she passed and winked. She laughed at the easy banter of the cousins, and just for a second wondered what it was like to have someone in your life who had known you all your life. Hearing her name being called just as she reached the sidewalk, Olivia turned to see Bruce jogging towards her. He stopped, only after he had more than invaded her personal space. He was taller than she first thought. Her three-inch heels put her at an even five feet, ten inches, and she still had to take a step back and raise her head to fully see his face. Bruce’s light brown eyes had an amused glint to match the devilish smirk on his clean-shaven face. His collar length dark brown hair was curly, though not as much as Courtney’s, and had the beginnings of gray at the temples much like her own. She reached for the card. The man was positively shameless. Olivia couldn’t help but grin. Glancing at the card in her hand, realization dawned on her. His face took on a bright shade of red as he blushed uncontrollably. His eyes widened, but she pointed at the tow truck and continued before he could respond. She reached her car and saw Rena was still sleeping. There was no sign of Courtney at the front door yet. She heard movement behind her and noticed Bruce had taken a couple of steps in her direction. Olivia tried without success not to laugh. The sincerity in his voice caused her pulse to race. He started to say something else, but both their attention was drawn to the front door as Courtney backed the wheelchair down the one step entrance, then turned and headed towards Olivia’s car. She glanced in Bruce’s direction, but looked away quickly, unable to hold his intense gaze. She smiled and gave him a single nod. His attention made her feel light-headed, but she knew she’d never call him. She couldn’t. He definitely seemed like the type of man who wanted all or nothing … and nothing was all she had. Courtney brought the wheelchair to a stop in front of her. Olivia moved to the car door as she unlocked it with the remote. She reached in to unfasten Rena’s seatbelt but caught the banter between the cousins. If Olivia didn’t know they were grown men, she would have sworn they were seventh graders. Rena began to stir and looked around, confused. Still disoriented, Rena tried to sit upright. She cried out in obvious pain and gripped Olivia’s arm. Olivia took her own advice and took a couple of deep breaths to calm herself. She couldn’t comfort the child if she needed comfort herself. She looked back at Courtney. Rena still held Olivia’s arm, but her grip was loosening. Rena nodded, and Olivia stepped back out of the way to give Courtney room to transfer her to the chair. She could feel Bruce’s eyes on her but refused to look at him. Olivia’s face grew hot and she felt awkward and out of place. Her resolve was weakening and she was about to look in his direction when a green minivan pulled up behind her car. Bruce clapped his hands together excitedly. Olivia could tell he was enjoying the moment and glanced back to the minivan not knowing what to expect. A plump woman hurriedly exited the van and rushed towards them. She was short—maybe an even five feet in height—and African American, with a mass of hair worn in a long, natural, wavy style. Though plump, her hourglass shape was more than obvious. She wore very little makeup, and she didn’t need too. Her full lips and smooth brown skin were enhanced by large, expressive eyes that right now were filled with worry. Just as she reached Olivia’s car, Courtney raised Rena into his arms, pivoted, and placed her into the wheelchair. The woman glanced from face to face waiting for an answer. She threw a quick wave in Bruce’s direction, and he returned it. She lightly patted Rena’s shoulder and kissed the top of her head. Marissa stepped behind her chair, gave Olivia one nod towards the house, and started towards the front door. Marissa stopped suddenly and turned around. She nodded her head in Bruce’s direction. The laugh escaped Olivia’s mouth before she could suppress it. These people were nuts… and she loved it. Courtney Bellamy looked as though tears might be a real possibility. Before Olivia could tell her they were all just fine, Bruce chimed in. Marissa popped a clenched fist on one hip and shot back. Olivia heard someone join her in the laughter, but when she glanced at Courtney, his eyes were full of love and fixed on his wife. Olivia stepped around Marissa and looked down at Rena, who had dissolved into a fit of laughter. She clutched her bag of snacks with one hand and her stomach with the other. Olivia’s heart melted at the sight. She then noticed Courtney had stepped behind his wife, sliding his hand around her waist. He kissed his wife behind the ear while giving a thumbs up to his cousin. Olivia was taken aback. Most of what she’d just witnessed was a performance purely for Rena’s benefit. She was so glad she had not prejudged these people and admonished herself for any negative thoughts she may have had about them. These were good, loving people who were just living life. Parents and kids get sick and cars break down, but it didn’t distract them enough they didn’t have time for a little girl who was… at least temporarily… an orphan. Although Olivia was sure the Bellamys and Averests must have had a pretty strong friendship for Courtney and Marissa to take Rena in, she felt this family would probably help any child in need. Olivia followed as Marissa pushed Rena into the house, but something made her stop and look over in Bruce’s direction. He was still standing there, hands in pockets, focused on her. Shaking her head, she smiled at him, which caused him to throw a big toothy grin back at her. Marissa had cleared the doorway and Courtney held the door for Olivia. Her face heated up again, but she was rescued when she heard Marissa call out for her to follow her voice to get to Rena’s room. Need a Good Read for the Weekend? “Forgive me if I’m being forward, Ms. Chandler, but I wanted to give you my business card. I own Bellamy’s over on Mason. If you ever need anything…um, for your car…give me a call.” She reached for the card. “Anything…at all.” The man was positively shameless. Olivia couldn’t help but grin. “Call me Olivia, and thank you. That’s nice of you.” Glancing at the card in her hand, a realization suddenly dawned on her. “Wait. You’re that Bellamy? Bellamy Motorsports of “We have twelve locations to serve you in Hennepin and Olmstead counties?” His face took on the brightest shade of red as he blushed uncontrollably. “Guess you’ve seen our commercials, huh?” She laughed as she backed towards her car. “Yes. A time or two…or twelve. The commercials never mentioned you were so…hands on.” His eyes widened, but she pointed at the tow truck and continued before he could respond. “The boss answering service calls?” He slid his hands into his back pockets and cocked his head to the side. “Okay, you got me. But Court won’t let anyone else touch his Precious. I was with him the day he bought her, but I’m not sure who owns whom? Marissa always teases him by telling him she’s leaving and he can have the house, but she’s taking the kid and the car. He nearly has a heart attack.” She reached her car and noticed Rena was still sleeping. There was no sign of Courtney at the front door yet. She heard movement behind her and noticed Bruce had taken a couple of steps in her direction. “Do you wanna be?” Olivia tried without success not to laugh. “Nope. But I’m usually not this forward either.” Suddenly serious, he continued. “It’s just not every day I meet a woman I’m so drawn to. Actually, this is the first time it’s ever happened.” The sincerity in his voice caused her pulse to race. “I’m flattered, Bruce.” He started to say something else, but both their attention was drawn to the front door as Courtney backed the wheelchair down the one step entrance, then turned and headed towards Olivia’s car. “Olivia?” She glanced in Bruce’s direction, but looked away quickly, unable to hold his intense gaze. “Olivia?” Taking a deep breath, she met his gaze. “Call me.” She smiled and gave him a single nod. His attention made her feel light-headed, but she knew she’d never call him. She couldn’t. He definitely seemed like the type of man who wanted all or nothing…and nothing was all she had. Download today – only #99cents! Remembering all the cars parked out front, Olivia knew there were quite a few family members in attendance, but when Marissa threw open the family room doors, Olivia was stunned. There had to be at least forty people before her, and a third of them were children. Leading the overwhelmed attorney through the throng of family, Marissa loudly announced, “Bellamys, this is Olivia Chandler. Olivia…the Bellamys. You’ll learn names in time.” Olivia managed to give a short wave as her evidently new life coach forged on. Passing through a doorway into the formal dining room, they approached four older women sitting at the table in a very animated discussion. “Well, you were always dying your hair blond!” Marissa dropped Olivia’s hand and threw her own up in frustration. “Please tell me you’re not having another ‘Who Was the Biggest Floozy’ argument? What if any of the grands heard you? Don’t make me call the Bellamy men in here!” Olivia figured that was not something the women wanted because they remained quiet and looked properly chastised. Marissa moved to stand behind the two bickering women, resting her arms on their shoulders. Motioning to the woman on her right, Marissa introduced her. “Olivia, this ruby red lipstick wearing firecracker is my mother-in-law, Bernadette Bellamy, and the bottle blonde here is her sister-in-law, Bettina Bellamy. They are married to brothers, but they are also cousins.” Olivia smiled at them both. “Mrs. Bellamy and Mrs. Bellamy…it’s a pleasure.” Bernadette held her hand up. “None of that Mrs.-stuff. I’m Aunt Bernie and she’s Aunt Bettie. She’ll answer to ‘streetwalker’ too!” Olivia’s hand flew up to cover her mouth and muffle her laugh, but the other women roared with laughter. Through narrowed eyes, Bettina glared at her cousin. “You’ll pay for that.” Bernadette pulled a face while still laughing. Marissa shook her head and stepped behind the other two women. “And this is my mom, Gladys Monroe, and her sister, Darlene Preston.” Olivia smiled at the women, but this time was hesitant to address them. They resolved the issue for her. “You can call me Lena”, Darlene grinned broadly and nudged her sister. Gladys waved her off. “You can call me whatever you like if you give me that gorgeous suit you’re wearing.” Olivia glanced down at her suit and back at Gladys Monroe, who wasn’t much taller than her daughter. “Don’t mind my mom, Olivia. She’s just always been a fan of tailored clothing.” Gladys waved her daughter off. “Olivia has excellent taste and a great eye. I wish I was built like you, young lady. You’re probably beating the guys off with a stick.” The flustered attorney grinned. “I’m not. But I do appreciate the compliment.” Marissa saved Olivia by changing the subject. Olivia’s journey is filled with fun and laughter…and tears and sadness. Will she get her happily ever after? Find out by 1-clicking today! 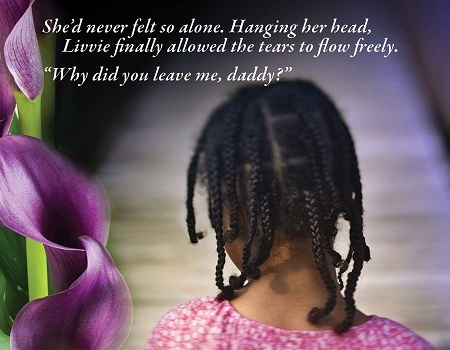 “In The Best Interest of the Child” by Felicia Denise is #LIVE! Guess who’s a published author? THIS GIRL! Now that the queasy feeling is gone and I no longer feel the need to throw up – because it was a real possibility – I invite you into Olivia Chandler’s world to see how a savvy child advocate attorney deals with the long-buried trauma of her own childhood after she receives a court-appointed case with haunting similarities. Olivia also has a chance at love for the first time in her life, but will she realize that before accepting love, she has to extend forgiveness? Download today for the new release price of only #99cents! Making sure Rena was still sleeping, Olivia exited her vehicle, following the sidewalk to the driveway where a flatbed tow truck came fully into view. A large, burly, dark haired man was winching a late model Mercedes up onto the flatbed. Nearby, a far shorter man stood with his arms folded across his chest obviously not happy. As she got closer, Olivia believed the shorter man to be near her age, even though a head full of curly black hair gave him a more youthful appearance. Olivia smiled as she passed the tow truck driver, noticing how his eyes lingered on her hips. The shorter man didn’t seem to notice her until she was right in front of him, and he started as though coming out of a trance. “Hello. Can I help you?” Olivia widened her smile. “Nice to meet you, Ms. Chandler. My wife, Marissa, mentioned you were meeting with Rena today. We can go inside and chat shortly, I just have to see when this guy will have my car up and running.” He spoke the last part of the sentence in a raised voice, making sure the tow truck driver heard him. The driver pulled a face in his direction. “There is way too much going on in this family for us to depend on one car, Bruce. There will be whining, tears and harsh words…and my wife will be upset too!” Olivia and Bruce both laughed out loud at Courtney’s snarky comment. “And if you call my mother, I will call YOUR mother and tell her who really broke the garage window when we were kids.” Courtney gasped. “Stay away from my mother, and I’ll stay away from yours.” He caught Olivia’s eye as she passed and winked. She laughed at the easy banter of the cousins, and just for a second wondered what it was like to have someone in your life who had known you all of your life. She heard her name being called just as she reached the sidewalk. Olivia turned to see Bruce jogging towards her. He stopped only after he had more than invaded her personal space. He was taller than she first thought. Her three inch heels put her at an even five foot, ten inches, and she still had to take a step back and raise her head to fully see his face. His light brown eyes had an amused glint to match the devilish smirk on his clean shaven face. His collar length dark brown hair was curly, though not as much as Courtney’s, and had the beginnings of grey at the temples much like her own. “Forgive me if I’m being forward, Ms. Chandler, but I wanted to give you my business card. I own Bellamy’s over on Mason. If you ever need anything…um, for your car…give me a call. She reached for the card. “Anything…at all.” The man was positively shameless. Olivia couldn’t help but grin. “Call me Olivia, and thank you. That’s nice of you.” Glancing at the card in her hand, a realization suddenly dawned on her. “Wait. You’re that Bellamy? Bellamy Motorsports of “We have twelve locations to serve you in Hennepin and Olmstead counties?” His face took on the brightest shade of red as he blushed like a teenager. “Do you wanna be?” Olivia laughed in spite of herself. “Nope. But I’m usually not this forward either.” Suddenly serious, he continued. “It’s just not everyday I meet a woman I’m so drawn to.” The sincerity in his voice caused her pulse to race. Courtney brought the wheelchair to a stop in front of her. “Cinderella’s carriage has arrived. Shall we wake her?” Olivia moved to the car door as she unlocked it with the remote. She reached in to unfasten Rena’s seatbelt, but caught the banter between the cousins. If Olivia didn’t know they were grown men, she would have sworn they were seventh graders. Rena began to stir, and looked around, confused. “Hey angel. You’re home.” Still disoriented, Rena tried to sit upright. She cried in obvious pain and gripped Olivia’s arm. “It’s okay, angel! It’s okay, I got you. Just breathe through it. C’mon, now. Breathe.” Olivia took her own advice and took a couple of deep breaths to calm herself. She couldn’t comfort the child if she needed comfort herself. “You okay, angel? Mr. Bellamy wants to transfer you to the chair. You’ll probably feel better once you can stretch out in your bed, okay?” Rena nodded, and Olivia stepped back out of the way to give Courtney room to transfer her to the chair. She could feel Bruce’s eyes on her but refused to look at him. Her face grew hot and she felt awkward and out of place. Her resolve was weakening and she was about to look in his direction, when a green minivan pulled up behind her car. Bruce clapped his hands together excitedly. “Oh yeah! The fun is really about to start.” Olivia could tell he was enjoying the moment and glanced back to the minivan not knowing what to expect. A plump woman hurriedly exited the van and rushed towards them. She was short – maybe an even five feet in height – and African American with a mass of hair worn in a long, natural, wavy style. Though plump, her hourglass shape was more than obvious. She wore very little makeup, and she didn’t need too. Her full lips and smooth brown skin were enhanced by large expressive eyes that right now were filled with worry. “What happened? Is everything alright?” Just as she reached Olivia’s car, Courtney raised Rena into his arms, pivoted, and placed her into the wheelchair. The woman glanced from face to face waiting for an answer. She threw a quick wave in Bruce’s direction, and he returned it. Olivia smiled at her while Courtney leaned over Rena’s chair and kissed the woman on the cheek. “Hi, Honey. This is Rena’s attorney, Olivia Chandler, and she just brought the munchkin home. Olivia, this is my wife, Marissa.” She took Olivia’s outstretched hand in both of hers and squeezed. “Oh yes. We spoke on the phone. So nice to meet you. And thank you for seeing her home.” She lightly patted Rena’s shoulder and kissed the top of her head. “Hey Munchkin. Did you hit all your markers in therapy today?” Rena nodded slightly. “After I got Bri settled inside, I was going to return to the office, and my car wouldn’t start. I called Bruce to come over and diagnose the problem, but…she’s really sick. He has to take her in.” Courtney Bellamy looked as though tears might be a real possibility. “Please excuse our family. We’re not usually this scatterbrained and dysfunctional. And we usually care more about our sick children than our sick cars.” Before Olivia could tell her they were all just fine, Bruce chimed in. Olivia heard someone join her in the laughter, but when she glanced at Courtney, his eyes were full of love and fixed on his wife. Olivia stepped around Marissa and looked down at Rena, who had dissolved into a fit of laughter. She clutched her bag of snacks with one hand and her stomach with the other. Olivia’s heart melted at the sight. She then noticed Courtney had stepped behind his wife, sliding his hand around her waist. Rena was still laughing when he softly said, “Once they get started, they won’t stop until Rena laughs.” He kissed his wife behind the ear while giving the thumbs up to his cousin. Olivia was taken aback. Most of what she’d just witnessed was a performance purely for Rena’s benefit. She was so glad she had not prejudged these people and admonished herself for any negative thoughts she may have had about them. These were good, loving people who were just living life. Parents and kids get sick and cars break down, but it didn’t distract them enough that they didn’t have time for a little girl who was…at least temporarily…an orphan. Although Olivia was sure the Bellamys and Averests must have had a pretty strong friendship for Courtney and Marissa to take Rena in, she felt this family would probably help any child in need. Olivia followed as Marissa pushed Rena into the house, but something made her stop and look over in Bruce’s direction. He was still standing there, hands in pockets, focused on her. Shaking her head, she smiled at him, which caused him to throw a big toothy grin back at her. Marissa had cleared the doorway and Courtney held the door for Olivia. When she walked past him, he touched her arm lightly and quietly said, “He’s a good guy.” Her face heated up again, but she was rescued when she heard Marissa call out to her to follow her voice to get to Rena’s room.